Jonesin’ to play, I approached them. Jim (dad) and Joe (son) were visiting from the Twin Cities. Not wanting to interfere with their game, I let them know I was available if needed. I believe I looked quite enthusiastic. They insisted I join them. Only a 4-1/2 hour drive separates our homes back in the states, and we discovered we each have connections to the other’s community. 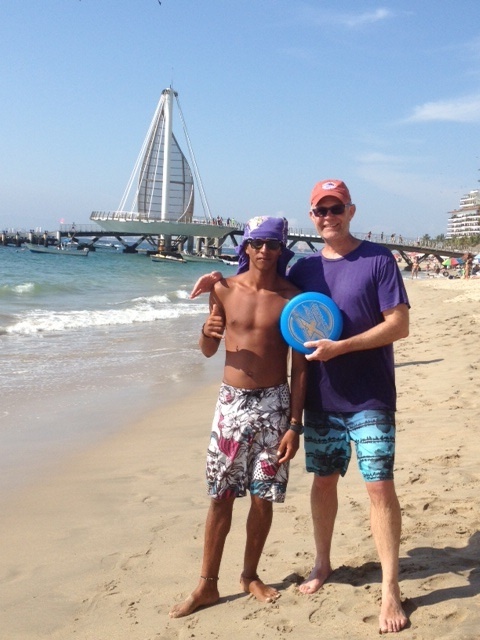 Before long we caught the eye of some local guys who did not speak English, but no problemo — they spoke Frisbee – or disco volador. More fast friends for Frisbee! I’m still smiling. It would turn out to be a marathon afternoon of throwing, catching, and sometimes not catching. 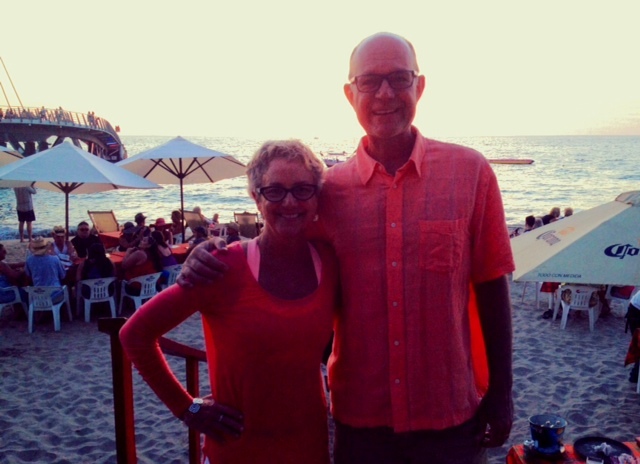 I took a time out so Betsy and I could move our stuff in front of a nearby beach restaurant. This is when we encountered Hank. I never did get his actual name. I call him Hank because he reminded me of the character on Breaking Bad. He’s the bald guy in this photo. It was a genuine Tennessee family reunion, seated outside the restaurant where we were going to order lunch. When I started to put up our umbrella and chairs, Hank looks at me, shakes his head, and says, “Not there.” The Corona in his hand – and I could be wrong – was maybe his fourth or fifth. Of course, I would never say any of these things. A) I would have been physically hurt, and B) It obviously was not worth arguing over. I mean, hello? Vacation, Betsy, Frisbee, swimming, lunch… great day! So, we find another spot and place our order. I smile back at her. I’m fine. Everybody here is just trying to have a good time. 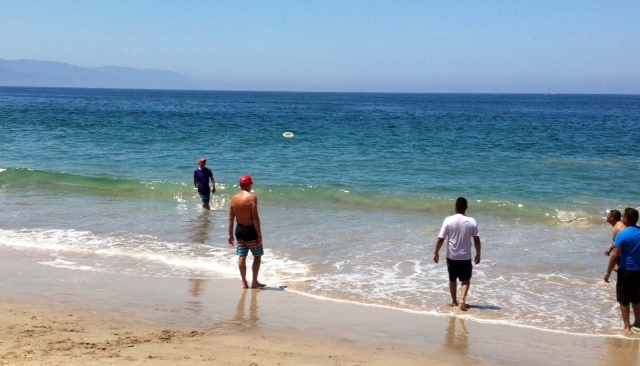 Of course, this family is entitled to the entire 50 feet of beach between them and the water – wait! I’m not going there! Going…for…Frisbee! After lunch, while a few of us were back tossing it, Betsy said she’d heard Hank’s wife mention the Frisbee. I went over and asked if anyone wanted to join in. Hank shook his head no, but his wife got up and got busy with it! She was good, too. Soon they were assembling for a family photo, which I offered to take. In this pic they are getting set up for it. Afterwards, a few more of the family joined in. 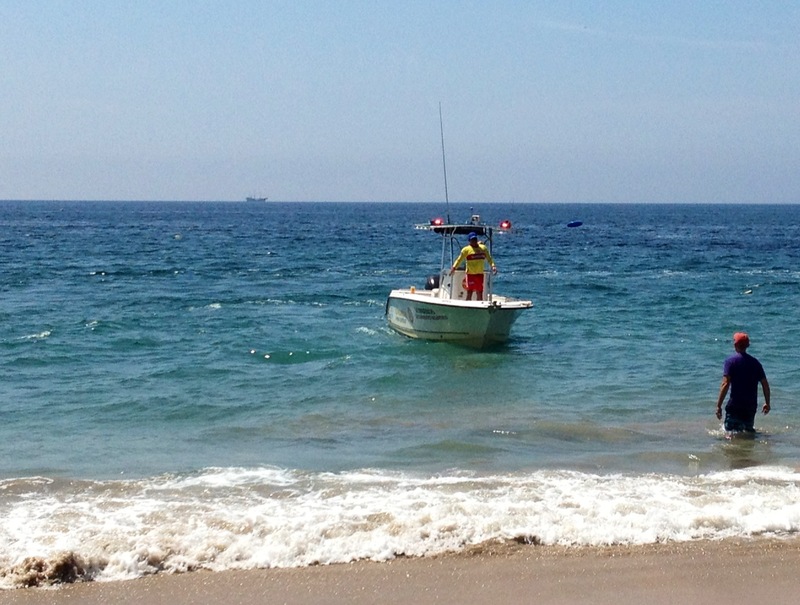 Then Christian, a young man who seemed to have several economic interests on the beach, ran by. I flagged him down and tossed. It was a bad throw, but he jumped about 100 feet up to snag it. Christian continued over the next several days to be a most reliable player during his short breaks from his jobs. Kirk has written about our experiences in Toronto witnessing “the Bee” help to build community, at least for a moment or two, as we walked and walked, keeping the disc in the air as much as we could. Practicing even short-term relationship building, we think, is a good thing. Oh, there was diversity on this Mexican beach all right, which included a man central to the story, who never even played, who pushed my buttons, and who helped me along the journey. I thank Hank for that. One last thought: While offering invitations with the Frisbee, seeking connection and just plain fun, it’s a thrill to engage someone in a uniform. Will the authority figure accept the invitation? Will they pause for a moment of play during their serious job? I found the answer to be “Si!” with this lifeguard. I gave him the invitation sign, he held his arms out, and bull’s eye. He then returned a perfect throw! All in all, a pretty perfect day. Estoy agradecido.